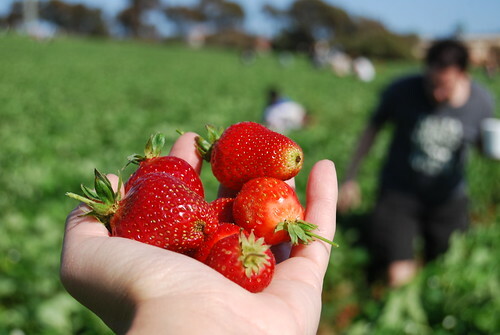 Imagine fields of strawberries luring you in. Imagine rows and rows of juicy, red fruit ready for the picking. And imagine wearing the most inappropriate shoes ever. 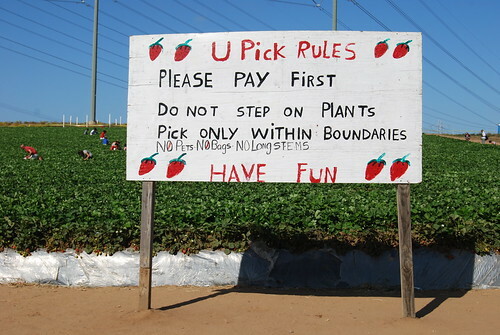 Well, sandals may not be the most inappropriate (hello high heels), but it is a most unpleasant way to get your feet dirty while picking fresh strawberries at Carlsbad U-Pick Strawberries stand, right off Interstate 5 on Cannon Road. It’s an institution that’s been in the same location for several decades and its strawberries can usually be found at the local grocery stores like Trader Joe’s or Sprouts. If farm-to-table is your thing, this place is the real deal. With strawberry season in full swing, there’s no doubt — the strawberries are fresh. But looking for ripe fruit can takes some work if the fields are full of people searching for the same thing as you. Come to the fields empty-handed because they provide the containers: $8.25 for a small styrofoam container or $18 for a large bucket. 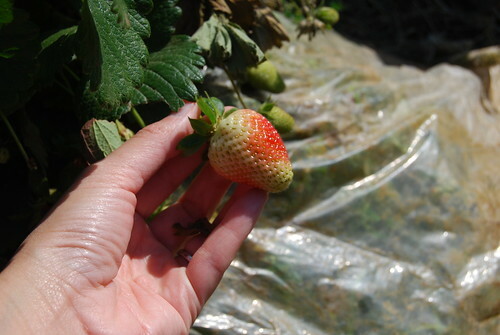 If wandering the fields looking for ripe strawberries isn’t your thing, prepicked baskets are available starting at $3.75 for one basket up to $35 for a flat (the best deal). 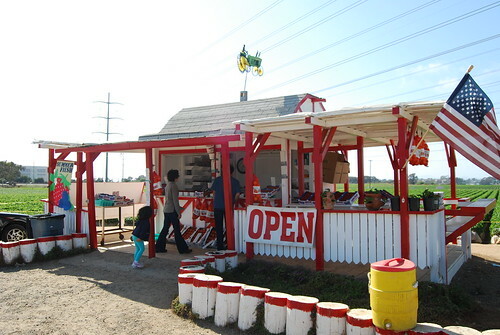 U-Pick Strawberries are open daily 9 a.m. – 5 p.m. as long as the season lasts. Nice photos! I’ve seen it from the 5 and always wondered about it. Glad to hear they’re local. Thanks! Local since the 1940s. Time for strawberry ice cream!! Any time is ice cream time but especially strawberry ice cream! Ahhh, I love summer. I love that first picture! Thanks! The person in the background wearing a gray shirt is Paul picking strawberries since I complained about getting dirt in my sandals. Indeed it is strawberry season! I bought a 3-lb. box at the Commissary yesterday; I made sure it was from CA; they are the best! Aw that’s cool you get CA strawberries on the East Coast! I’ve been wanting to go for some time now but the Mister is a no go. I told him he could eat as much as he wants while picking but he said he couldn’t wash them. Party pooper. Honestly, I’ve been wanting to go for a few years and luckily, I caught Paul at a time when he was weak. Those fields are so much bigger than the one down in CV! Picking berries is a lot of hard work! Thanks for the tip about the shoes! 🙂 I will make sure not to wear my peeptoe platform heels! I still need to visit the fields in Chula Vista. I’ll check your site to get the location although I’m kind of sure of where it might be.